Formed by a bunch of beach-buddies from Warilla High, Mondo Kaine were your typical local rock band of that time: four blokes with a penchant for the sounds of Hendrix and Creedence coming from across the waters. Geoff 'Ged' Holmes (bass/vocals), Steve Keelan (lead guitar), and Trevor Rix (drums) were inspired to pick up their respective instruments after seeing surfing pal Wayne Rogers plug his guitar through into old turntable amp. 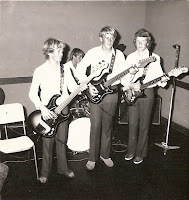 Getting work on their local milk-runs allowed the 13-year old boys to save up for the much-needed instruments and before long the band had obtained enough gear to start practicing in their parents' garages. 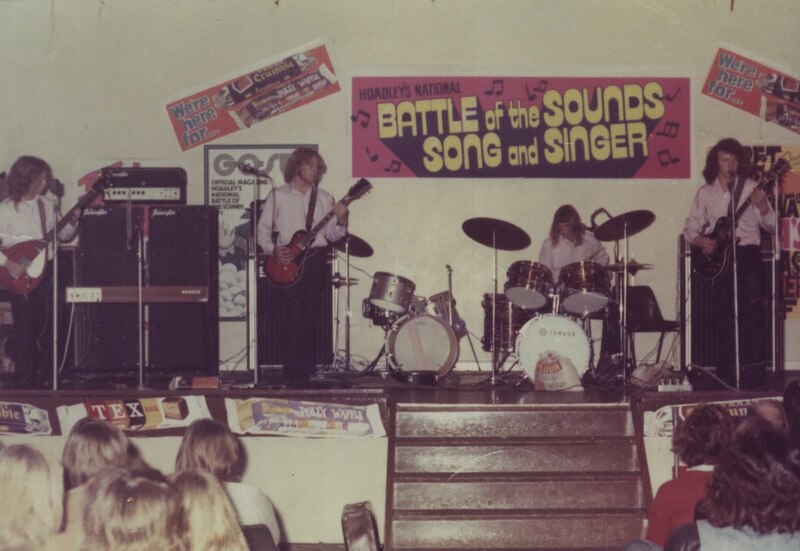 Originally going by the name of Triak, they scored their first gig at Oakleigh Park Hall on Shellharbour Rd, Warilla. Keelan laughs now as he recalls the hall backed onto a tennis court, and was used for the players' morning tea, only to be turned into a concert hall for teenagers in the evenings. Following the Oakleigh Hall gig Triak began playing the usual events (school dances, weddings, band comps, etc...) and in mid-1970 changed their name to Mondo Kaine. As the players matured so did the venues, and the band got a regular spot on at The Charles Hotel in Fairy Meadow which Keelan describes as a haven for rock acts at the time. Mondo Kaine entered themselves into a band comp held at Dapto Showground which included local and Sydney-based bands but, according to Keelan, were "duly eliminated". The winners on this particular night were Rose Tattoo. The band also played at a 'tribute' concert of sorts at Lang Park, South Wollongong following Jimi Hendrix's death. 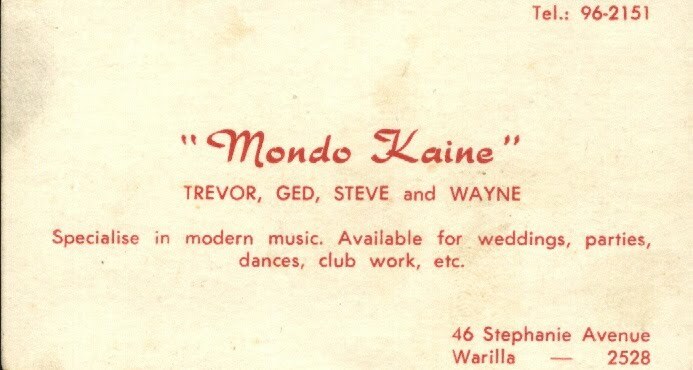 Sadly, Mondo Kaine split in 1973 without recording. Following Mondo Kaine's demise Holmes, Rogers and Rix all went on to perform with Low Key. Holmes and Rogers also played together in Liberty, East and Section Eight, whilst individually Holmes played with Cargo, and Rogers played with New Tricks. Wayne Rogers is currently a member of The Tornadoes - quite possibly the world's longest surviving band. Keelan chose not to pursue music until later in life, when he played with the NSW Irish Pipe Band. Special thanks to Steve Keelan for providing the neccesary information for this piece. Fond memories of those days and the guys and their girlfriends. They were such a wonderful part of my youth. I remember these times well, they inspired me to take up music as well, after many years I finnaly played with Wayne in the Garth Brooks Tribute Show and we formed Tic Toc City out of that.